Ten years. The nation is writing about it, thinking about it, re-living every detail of what happened when a beautiful September day became etched in our collective nightmares. There are educators arguing over what we should (and shouldn’t) teach our children about that day. There are news anchors providing voice overs for fiery footage, over and over and over again. And there are bloggers and celebrities and morning talk show hosts asking us to remember where we were when the entire country took a collective gasp as we watched that morning unfold. What it felt like. What we did. How we responded. That doesn’t feel right to me. It’s not about how I felt. I was sitting in my mom’s living room, safe in California, glued to the television. Actually, I had been sleeping. My dad called from San Francisco and said that they had evacuated his office building. “Go turn on the TV honey. This is history happening right now.” I was home from college and about to go back to finish my last year. I had a love of politics and an insatiable appetite for news, but I had never seen anything like this. I had spectator’s grief. Of course I was afraid, and of course I felt empathy and compassion and sorrow and rage for all of the lives that were lost. But it wasn’t my husband or daughter or father. I didn’t understand it in an adult way, because I wasn’t an adult yet. This September 11th, I am overwhelmed by the thought of what it must’ve been like for husbands and wives whose partners never came home. Suddenly I am a mother, and a wife, and a partner who sometimes forgets to kiss Max’s Daddy goodbye when he leaves to board a plane for yet another business trip that takes him across the country. Like all of those Mommies and Daddies did on that September day. 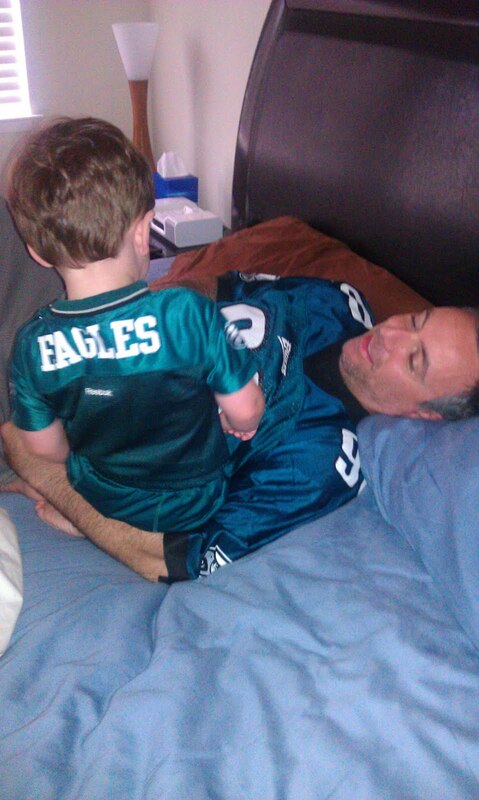 I have a two year old who wears his Eagles gear on Sunday morning so he can be just like his Daddy, and asks me 5 billion times a day “Da-da car?” because he wants so badly for it to be the time when Daddy gets home. Suddenly it occurs to me that so many little boys just like Max never got to see their Daddy come home, and THAT sadness overwhelms me. So today is not about how I feel about what happened. It’s about how THEY feel. It’s about bearing witness to the undeniable intersection of sadness and the beauty of how these parents lived their lives. It’s about acknowledging the thousands of families who were splintered that day when their partners cars didn’t drive back into their driveway. It’s letting them know that we acknowledge THEIR pain, not ours. And maybe, just maybe, it’s about turning off the TV and saying out loud that we respect their privacy. Because when you really stop to think about it, watching what cameras captured on that day means that you are watching someone’s child pass away. When my friend Mike was murdered many years ago, there was news footage of the minutes after he had been stabbed. A camera crew captured the 30 seconds where he was put on a stretcher and wheeled into an ambulance. Over and over and over they played that footage, at 5pm and at 6:30 pm, and at 11 pm. I participated in a documentary that summer and when they profiled me (and my friendship with Mike) they chose to use that footage. I was horrified. That picture of him on the stretcher was private. That was NOT the young man that I had laughed with. That was not how I wanted the world to know the person who had hugged me and told me about his mom and his adventures and his dreams. Someone, at some point, called the news station and asked them to stop showing it. Those were the minutes where Mike lost his life. His last breaths were private. Can you imagine how his mother felt, watching the images of him dying, over and over again? Can you imagine how his best friend felt? His best friend who was there with him, and had to see it all re-played on the nightly news, over and over again? We replay the images of September 11th because we feel like we all lost someone. I get that. I can appreciate that we all want to learn from that day. We want to “never forget”. But does bearing witness mean that we allow our media to show us the moment that thousands of people died, over and over and over again? We are a country numb to violence. We pay $12 a movie ticket to watch action “heroes” shoot each other and blow things up. September 11th was not a video game. Watching those planes hit the twin towers may be part of our collective history, but it is also the moment that someone’s loved one died. It is the instant that families changed forever. And for me, bearing witness means that we do not intrude on what is a very private moment for thousands of families, even when it happened so publicly. On this day, I ask that we bear witness not by watching everyone die over and over again, but by paying tribute to the ones they left behind. Write about them. Reach out to them. Acknowledge the families who have spent ten years rebuilding their lives. Find them. Find them in their grief, find them in their healing, and ask how you can help. And the effects of that day do not begin and end that morning. There are also military families who live each day waiting for a call from their soldier in Afghanistan. There are children who have to wait far beyond dinnertime to see their own daddies come home. Invite a military family to a holiday meal, ask them if you can buy their groceries or fix their car. Their partners are making the ultimate sacrifice too. On this day, as a mother and a wife, I can tell you that I will be sure to never forget to kiss these boys hello and goodbye each morning. ← That’s What I’m Talkin’ About!